In recent weeks, I’ve expressed very pointed concerns about market risk, emphasizing that the most negative market return/risk profiles we identify are associated with a severely overvalued, overbought, overbullish syndrome of conditions that is then followed by a clear deterioration in market internals (across a broad range of individual stocks, industries, and security types such as low-quality debt). At the same time, it's important to remember that, as in 2000 and 2008, even when we identify market conditions as extremely hostile, short-term action can be something of a coin flip. In some cases, the market can fall to a very oversold short-term low, and then the bottom completely falls out in a vertical decline (as we observed at numerous points during the 2000-2002 and 2007-2009 collapses). In other cases, short-term oversold conditions are “cleared” by what we’ve long called “fast, furious, prone-to-failure” advances. These generally feature lower trading volume than was observed during the preceding decline, with a concentration of buying activity on speculative and heavily-shorted names. That’s essentially how one characterizes a “short-squeeze” – frantic and somewhat price-insensitive efforts to chase a perceived reversal in beaten-down names, coupled with a backing-away of sellers. The result is a nearly vertical but low-volume advance. The panel of charts below shows the Dow Jones Industrial Average in those prior episodes, with the present episode at the lower right. The rounded green arrows identify the bull market peaks in DJIA (or in the 2014 chart, the highest level observed to-date), while the red arrows identify “fast, furious, prone-to-failure” advances that followed the market peak, generally after market internals had already deteriorated. The spikes marked the highest points that the DJIA would see over the remainder of those market cycles, on the way to far deeper bear market lows. The 2000 instance saw an extended period of churning between the January 2000 bull market high in the DJIA and later in the year. The 2000-2002 bear market ultimately asserted itself in earnest once our measures of market internals shifted decidedly negative on September 1, 2000 (see the October 2000 Hussman Investment Research & Insight). In the 2014 chart, the red arrow identifies the rally over the past several sessions. 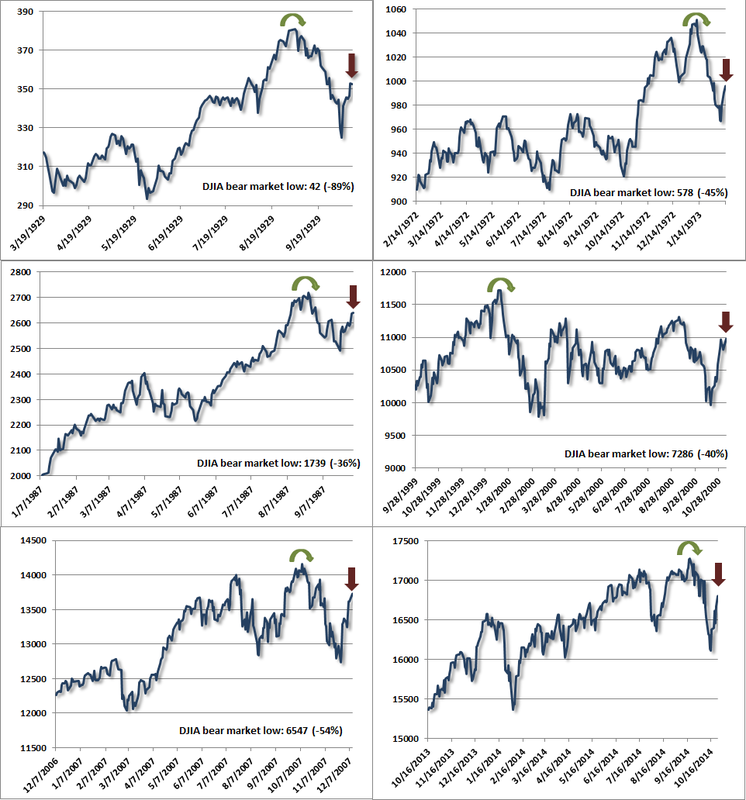 What characterizes the instances below is not simply a decline from a market peak and a subsequent rally, but the sequence from historically extreme overvalued, overbought, overbullish conditions (see Exit Strategy) to a deterioration in market internals, an initial "air pocket" decline, and a subsequent short-squeeze that fails to restore market internals to a favorable condition. Of course, the prior episodes shown below are not themselves indicative of what will occur in the present instance, and current conditions might not be resolved in the same way. Still, investors should interpret recent market strength in its full context: we’ve observed a fast, furious advance to clear an oversold “air-pocket” decline – one that emerged from the pairing of rich valuations with a breakdown in market internals. Having cleared that oversold condition, we remain concerned that the pairing of rich valuations and still-injured market internals may reassert itself. To reiterate what I wrote in June 2008, just before the market collapsed, “Again, falling interest rates, moderate valuations, and very strong market action early into the rebound are useful in separating sustainable advances (even sustainable bear-market rallies) from the fast, furious, prone-to-failure variety.” Those would still be among the primary considerations that would lead us to an optimistic or aggressive market outlook. As always, the strongest market return/risk profiles we identify are associated with a material retreat in valuations coupled with an early improvement in market action. We’ll take our evidence as it arrives.